Last week EUR/JPY fell strongly from 101.46 but found support at 99.24, which was above the previous low and support of 98.92. 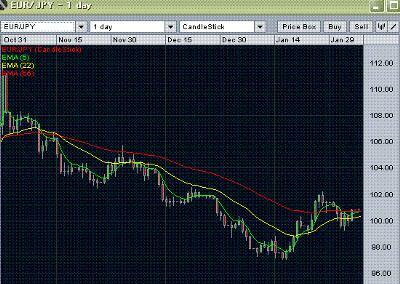 The currency pair, then, moved to 100.88 and closed for the week at 100.79. For the coming week, though initially we stay neutral for EURJPY but if the currency pair does not break below 99.95 then we would expect some more upward gains towards the resistance of 101.46. For any further upward gains, the break of this resistance i.e. 101.46 is important. This level represents the previous resistance as well as the resistance of the upper edge of the daily Ichimoku cloud. A firm break of 101.46 may take EUR/JPY to retest 102.22. On the upside even a break of the resistance of 102.22 should bring some stronger resistance near 102.52, which was the peak of the resistance zone during December 14th to December 27th, 2011. If EURJPY breaks over this resistance then we would expect further slow move towards the psychological resistance of 104.80/105.20. On the downside any firm break below 99.95 should bring some support near 99.60/99.65. A break of this will also indicate the break of the minor support of daily Ichimoku cloud’s Kijun line support and in that case we would expect further down ward move towards 98.80/98.90 i.e. one of the previous supports as well as the lower edge of the daily Ichimoku cloud. Any firm break below 98.80 will indicate that the recent correction is over and we can change our focus back towards a retest of 97.03. As we have been mentioning for past couple of weeks that below 97.00 the strong psychological support of 95.00 would start working and any subsequent downward move should be slow and with frequent supports near 96.60 and above 96.20 and 95.60. But in case the market sentiments do not have sudden change because of some major economic news from the Euro zone, subsequently we expect a move towards 94.10/94.05 (inverse 61.8% projection of the upward correction between October 3rd to 30th and also the psychological aspects of the price action). You may also check the weekly eur jpy forecast and daily eur/jpy analysis at ForexAbode.